Quitclaim Deed Vs. Warranty Deed: What’s the Difference? A deed is a legal document that contains a thorough description of a property that one property owner may wish to transfer to a new owner. When concerning a property in an urban or suburban environment, the legal description of the property should identify which lot the current owner occupies in a platted subdivision. In rural areas, the deed might utilize metes-and-bounds descriptions of the boundaries, which identify where the property lines are in relation to landmarks. Regardless of the type of property in question, a deed must identify the grantor, or the person handing over interest in a property, and the grantee, or the person accepting interest in a property. A deed is only valid if it contains words of conveyance, or the original owner’s intent to transfer interest in the property over to the grantee. The sole purpose of a deed is to convey or pass real estate from one party to another and to ensure that there are no questions of ownership once the transfer is complete. 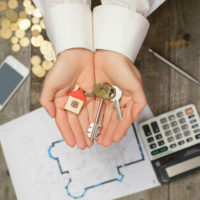 Whether your goal is to add your spouse’s name to your home’s title, to inherit property from your parents, or to buy a house from a stranger, the deed to a property can help you accomplish your transfer goals. It is important to note that a deed is not a sales contract. A sales contract is essentially the promise to transfer property in exchange for something else, usually money. A deed, on the other hand, is not a promise to convey, but rather, the conveyance itself. For this reason, you must be very careful in how you word your deed, especially if you hope to be compensated for the transfer of your property. The owner transfers his or her property to a living trust. When one uses a quitclaim deed, there is no guarantee that the grantor is the rightful owner of the property in question. Therefore, there is no guarantee that the grantor has the right to transfer the property at all. A warranty deed, on the other hand, is a deed in which the grantor guarantees that he or she rightfully owns the property and has the right to transfer it. It also promises that the property is free and clear of all liens and possible restrictions. Finally, the type of deed asserts that another person will not and cannot come and claim the property or an interest in the property for him or herself. If it turns out that any of the claims claimed in a warranty deed is false, the buyer is entitled to compensation. To ensure the seller remains true to his or her word, he or she is required to purchase title insurance to back up the claims. This is the type of deed most lenders and realtors require when dealing with real estate transactions. When you use a quitclaim deed, you are not guaranteeing that you own the property outright. Rather, you are saying you are transferring the property to the grantee. There is less protection with a quitclaim deed for the buyer or grantee. However, for you, the grantor, there is more legal protection. If it turns out you did not have the right to convey the property, the buyer or recipient of the property cannot pursue any legal action against you. For this reason, Fort Lauderdale real estate attorneys generally recommend against using a quitclaim deed unless the property stays within family, in which case, the risk is a lot slimmer. Occasionally, property owners use quitclaim deeds in combination with warranty deeds. They may use a quitclaim deed on a portion of the property that borders state rivers and parks, or areas on which ownership is unclear. On the house or other clearly marked areas, the owner may use a warranty deed to entice legitimate buyers. If you plan to convey property to a loved one, stranger, spouse, or any other interested party, make sure you use the correct type of deed. Also, make sure your deed contains provisions that protect both you and the buyer in the event of adverse action. For help deciding which deed to use and how to draft it, contact the Fort Lauderdale real estate lawyers at the law office of Edward J. Jennings, P.A., today.